Professor Gabriela Shalev (67), is the new Israeli Ambassador to United Nations, replacing Ambassador Dan Gillerman, who held successfully this post for five years. 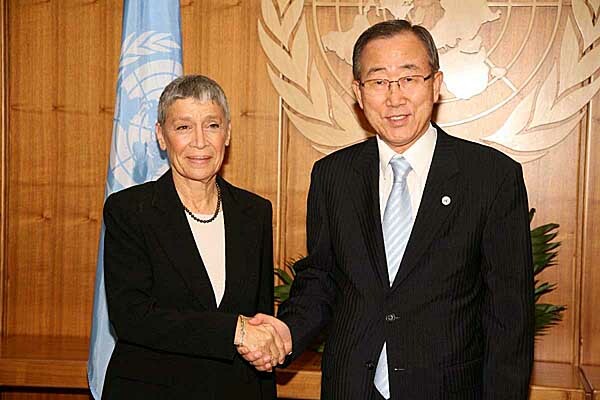 She has submitted her diplomatic credentials to Ban Ki-moon, UN Secretary-General, becoming historically Israelʼs first female holding this high rank and important position. She told the UN Secretary General that her priorities are "the Iranian nuclear program and the disarmament of Hizbullah, under the terms of Security Council Resolution 1701, as well as Israeli-Palestinian conflict and various other issues, such as scientific/technological initiatives, and women/children's rights." She also said that she is representing not only Israel , but the Jewish people in the Diaspora. Prior to her appointment there was a "quiet fight" between Foreign Minister Livni and President Peres, Knesset Chair Daliah Itzik Defence Minister Ehud Barak and PM Olmert and others, who all preferred Alon Pinkas, a very successful former Ambassador/Consul General to New York, (and pro Labor party) for the job. But Tzipi Livni dissenting from the idea, had decided on choosing a woman for this post. First she offered it to Ilana Dayan, an Israeli media personality. When she declined - the offer passed over to Professor Shalev, who accepted it, though she is a political outsider and has no diplomatic experience what so ever. Gabriela Shalev is an expert in comparative and contract law. Until 2002 she was a professor of contract law at the Hebrew University of Jerusalem - where she had studied and earned her Bachelor's and Doctorate degrees -taught at Harvard Law School, Boston College and Temple University' as well as at other institutions of higher education across the US, Canada and Europe. Prior to her appointment, Ambassador Shalev served as President of the Academic Council and Rector of Ono Academic College, near Tel Aviv. She also served as board member of leading Israeli corporations, including Teva, Delek and Bank Hapoalim. She also was a member of the Jewish Agency board of government and a chairwoman of the Israeli Broadcasting Authority. She has written ten books and numerous articles, both in Hebrew and English. Gabriela Shalev is a war widow. Her husband, Israeli Army Officer - was killed in the Yom Kipur War in 1973. They had two young children, whom she raised by herself. She loves Opera, Classical Music and Art. Her friends and people who know her are praising her, indicating her talents/skills/know-ledge/understanding and working ability. "She is an excellent choice for this roll", they say.